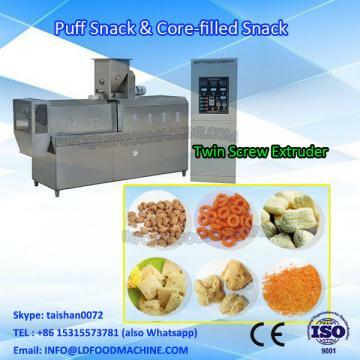 Twin Screw Extruded Corn Puff Snack Cheese Ball make machineryadopts advanced share exrtusion Technology, which can extrude products with different textures and tastes out of Double-Screw Extruder at the same time. It can produce a Variety of direct puff which are popular in the worldmarket, such as fragrant chicken, core-filling rolls,etc. It can also produce nutritional powder,grain gruel and many other snacks by changing different mould and assistants equipment. This automatic process line is of LD level for its superior characters "Normal materials, convenient operation and maintenance, lower power consumption, higher output. 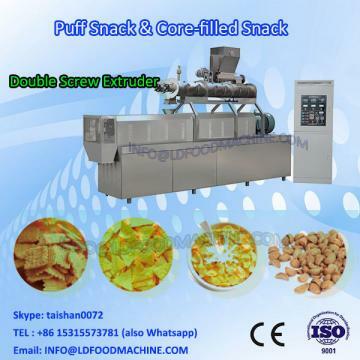 5) Double screws feed equal materials forcibly.Corn Puff Snack Processing Line with Cheap Price.